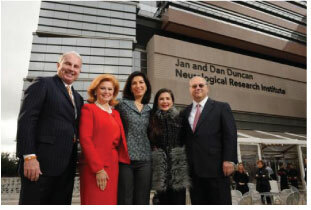 The recently opened Jan and Dan Duncan Neurological Research Institute (NRI) in Houston, Texas is dedicated to scientific exploration of childhood neurological disorders. Director Huda Zoghbi, whose laboratory established that mutations in MECP2 cause Rett Syndrome, envisioned a center where researchers with diverse interests could work within an environment of ongoing, cross-disciplinary dialogue. The soaring new structure is located in the heart of the Texas Medical Center, close to the basic science campus of Baylor College of Medicine and Texas Children’s Hospital. 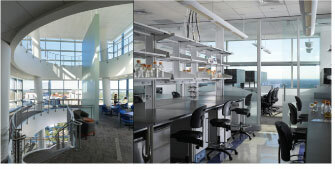 At full capacity the NRI will provide laboratory facilities for 50 to 60 investigators. 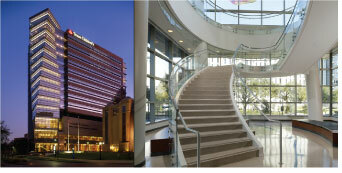 All NRI investigators are Baylor College of Medicine faculty. Below are excerpts from a recent conversation between Dr. Zoghbi and Monica Coenraads, RSRT Executive Director. MC: Dr. Zoghbi, it was wonderful to witness the recent opening of the NRI, the culmination of a lead fifty million dollar gift by the Duncans, an outpouring of support from the local community and years of work. The unique architecture reflects a specific functional goal: the creation of a powerful center for collaborative research on children’s neurological disorders. In shepherding this concept from an idea to a most impressive reality, I know you were involved in every aspect of its development. Congratulations are in order! And now that this beautiful facility is open for business, tell us how the next steps are progressing. HZ: I think there are really two phases now that are moving in parallel. One is the recruitment of talented faculty to occupy the laboratories of the first five floors that have been completed. The second will be to continue our expansion, which is being built by stimulus money and will hopefully be ready for additional recruits in 2012. MC: I know the physical layout of the building goes beyond its striking appearance. You had a particular vision in mind. In fact, you coined a new descriptive term: collaboratory. HZ: Yes. The design is specifically intended to promote and enhance interaction between investigators within the building, and communication with adjoining faculties. We have tried to structure this within individual labs as well as the institution as a whole. In an age where most people will text or send an e-mail message rather than walk across the hallway to talk to someone, we have arranged work areas that are conducive to actual conversation, and social spaces that invite and encourage movement and exchange. Investigators with different areas of expertise will be able to access shared resources. The collaboratory is a beautiful, very open glass tower, modeled after the DNA double helix; the stairwell is very spacious and pleasant. People will be drawn here, moving from floor to floor to lunch, have a cappuccino, take a break, use the exercise machines, and in doing so will naturally be interacting with fellow scientists from labs on different stories. So this collaboratory, this getting together people of different disciplines is still rather new, a kind of paradigm-changing shift from traditional science boundaries. As you recruit faculty, I imagine personality will have to play an equal role with intellectual excellence in considering a candidate. HZ: Yes, it is really important that the scientists we recruit be generous and receptive. Generous means they are willing to help and to share their ideas and contribute to others’ projects if their skills would be useful in a particular area. Receptive scientists are open to hearing input about their work. These are very important qualities and are key for an interactive research environment; we dream of a generation of scientists who really cherish such a philosophy. We are also establishing programs to help scientists transition to independence as soon as they are ready. Toward this end we will be creating NRI fellowship positions, to give brilliant young PhD graduates (two per year) the opportunity to work within an unusually supportive and nurturing environment. If their projects are successful, they will then be well positioned for highly competitive faculty appointments. MC: And this philosophy of the collaboratory is expanded even beyond the architecture of the new building, by the way the site was chosen. I know the location was very critical to you. HZ: The NRI is a Texas Children’s Hospital building, but I wanted it in a location where scientists from very different disciplines would have access to it. I also wanted our own scientists to be only steps away from institutions where the focus and expertise are on scientific problems that are quite different from problems seen in childhood neurodevelopmental disorders. For example, a researcher at Mitchell research building at MD Anderson (attached to NRI) who studies cancer and the epigenetics of cancer might make a discovery that has relevance to epigenetics in the nervous system. You really don’t know where the breakthroughs will come from, and so this cross-cultivation of work and ideas from different institutions has great potential value. MC: Tell us about the potential of this approach to accelerate and validate new work. HZ: If you know one technique very well, or even have multiple skills in one discipline, this is still not enough when you are trying to understand something as intricate as brain development and brain function. Somebody might come here with expertise in basic synaptic biology and neurophysiology, but is very willing to engage and think about how they could maximize the impact of their work by collaborating with someone who might be studying a model of Rett Syndrome or Fragile X. You truly need a great variety of specializations, including those from the physical sciences, to begin to tackle complex problems. Even with all of the expertise you can begin to put together, these problems are still challenging. MC: The readers of this blog are of course interested in Rett Syndrome. Can you speak about the kinds of resources that you envision being allocated for Rett research? HZ: We’ve recruited eight faculty members so far, and one of our first recruits was somebody who works in Rett Syndrome, Jeff Neul. In addition, we’ve really strengthened the physiology core. Our colleagues in neuroscience are doing some work using two-photon imaging of cortical neurons in animal models of Rett, so the NRI has purchased equipment for these experiments. (Editor’s note: Two-photon imaging is a type of microscopy that allows researchers to look in depth at living tissue.) Our behavioral core is designed to address the needs of large scale preclinical trials in Rett mouse models so we can expand the number of trials we do and expand our behavioral assays. Some of our new recruits will be investigators who bring in a skill set to look at Rett from different angles. Since Rett encompasses so many symptoms, the more we learn about it, the more we’ll gain knowledge that may be applicable to a very large range of neurological and neuropsychiatric disorders. MC: Along those lines, many children with neurological disorders suffer from seizures, chronic GI problems, and orthopedic issues. The approach thus far has been to try to ameliorate symptoms, but often standard treatments don’t work well and they really don’t address the underlying causes. Will existing faculty members or new recruits be focusing on looking more deeply into the mechanisms of these problems across different diagnoses? HZ: Yes, absolutely. One of the ways information will be exchanged at the NRI will be through series of regularly scheduled seminars, and some of these will focus on a specific symptom. We bring together clinicians with basic scientists, presenting problems from both points of view. We will invite GI experts, bone experts. The very serious problem of uncontrolled epilepsy may be the first topic we explore in this way. A symposium on this topic is currently in the planning stage. MC: And this leads into the situation of children who have symptoms but no diagnosis. There are girls who have a clinical diagnosis of Rett but no MECP2 mutations have been found for them. Will the NRI be a resource for these families? HZ: Sequencing costs are coming down, so it’s feasible to look not only at the children but the parents as well. We are beginning an initiative between our NRI investigators and the genome center to do large-scale medical sequencing for these patients. MC: On all fronts, then, the NRI is gearing up: Creative collaborative strategies, fresh angles of approach, in-depth examination of the symptoms that children suffer from in Rett and many other neurological disorders, and genomic investigation. You are really launching a powerful new interdisciplinary model for 21st century medical research. Thank you so much for your dedication to Rett research all these years, and for this interview. We hope to check in with you periodically for updates and anticipate great work from the Institute.